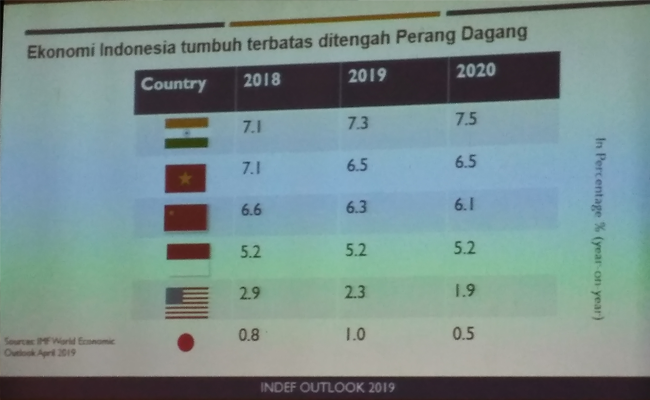 InfoSAWIT, JAKARTA – In 2019 the trade war effect between China and United States of America (USA) would be influencing for the agricultural business in Indonesia. But it needs to think positively to what is going on. It is no need too worried about because, as the facts showed, the total trade balance between the two countries in 2015-2017 was surplus US$ 10,3 billion. “The agricultural sector got surplus about US$ 1,9 billion and non-agricultural sector got US$ 8,4 billion,” Head of Planning Bureau, General Secretariat Ministry of Agriculture, Abdul Basit said when giving speech in a seminar “Tantangan dan Peluang Agribisnis 2019” where InfoSAWIT recently attended. To solve the impact of the trade war to the agricultural products, the government of Indonesia has published short and long term policy/strategy. The short term policy, for example, is done by increasing the market access to other countries (the expansion to the non-traditional countries) while for the long term, the government has arranged the strategies, such as, the first, do relaxation of export and on – farm investment license and processing industries. The second, create the conducive climate to develop the import substitution of the material; the third, give the incentive for the companies which are export oriented; and the fourth, provide the international negotiators in the agricultural sectors. The real role of the government, Abdul continued, to support the conducive agribusiness climate in 2019, namely to anticipate the impact of trade war between China and United States of America (USA), are, the first, Ministry of Agriculture had launched ‘One Stop Management’ on May 15th, 2018 in the license to make the process more efficient.